Ekaterinburg Mayor Arkadiy Tchernetskiy has been running the central Russian city’s administration since 1992 when he was appointed to that office by Presidential decree. When the federal law on the basic principles of local self-government in the Russian Federation was adopted, he was elected by 70 per cent of the citizens. He is now in his third term. Arkadiy Mikhailovitch Tchernetskiy was born in 1950, the son of an engineer and surgeon. In 1972 he graduated from the Urals State Technical University as an engineer and started his career at the Urals Transportation Machinery Plant, where he rose from the status of common employee to deputy director. In 1987 he was appointed general director of the Urals Chemical Machinery Plant. On each promotion he headed failing divisions, which he rapidly made efficient. By the time he was appointed Mayor, the city of Ekaterinburg was experiencing all the ‘diseases’ of a collapsing country. But being a gifted manager, Mr Tchernetskiy rebuilt the whole system  including public transportation, water supply and road construction. And that’s why when the new democratic procedures were launched, Mr Tchernetskiy was elected. Since that time the city has changed greatly. At the very foundation of Ekaterinburg was its industrial centre, which, as was usual in Russia, failed to provide its citizens with reasonable standards of living. The new Mayor stopped support for the big plants and factories, which were declining, and instead gave opportunities for development to the emerging trade and service sectors. These policies attracted a great deal of criticism in the mass media, but time showed that this approach was correct. Today, Ekaterinburg is a dynamic trade, service, education, cultural and transportation centre - Russia’s third city. Indicators show that certain areas of quality of life are higher in Ekaterinburg than even in St. Petersburg, which has much more development opportunities and comparative advantages. Ekaterinburg still remains an industrial city, but retaining and maintaining only the knowledge intensive types of activity. Only the dirtiest and less efficient enterprises have been lost. The rate of unemployment is approaching zero. Ekaterinburg has turned from being an unattractive city, losing its inhabitants, into a city with a high rate of newcomers. Ekaterinburg in 2005 is a place booming with housing and commercial construction, with growing outside investment. When Mr Tchernetskiy was asked what was his biggest success over the past 12 years, he replied: ‘Managing to create in the citizens a sense of patriotism for the place in which they live. People are now proud to call themselves citizens of Ekaterinburg.’ In recognition of his achievements, Mr Tchernestkiy was elected President of the Russian Cities Union. In that role he represents the interests of the cities in the Federal Government and Parliament (the Duma). He was one of the first Mayors to realise the necessity of clarifying and defining distinctive rights in city development between the federal, regional and local levels. Always trying to defend the constitutional autonomy of the city, he was constantly criticised as being a separatist. But on the contrary, Mr Tchernetskiy has always emphasised the priority of state unity, speaking of the large cities as ‘locomotives’ of national development. One of his acknowledged achievements has been the creation of a new system of city planning. The city’s strategic plan is a model known to be one of the most progressive and superlative in Russia. For his scientific contribution, he was awarded a doctorate in economics. His decisive policies have attracted many opponents and critics. However, the polls in Ekaterinburg show that the inhabitants recognise the immense role played by their Mayor in the rapid development of their city and the obvious improvements in their standards of living. 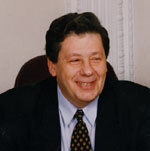 For his achievements as a democratic leader, Mayor Tchernetskiy has been awarded several state orders and medals. Ekaterinburg, with a population of some 1.5 million, is situated in central Russia on the east side of the Ural Mountains. Forests and lakes surround the city. Winters last for five months, from November to the middle of April, when temperatures can fall to minus 35 degrees Celsius. In the region’s short summers (two to three months) the temperature averages 20 degrees Celsius. The city is named after Ekaterina, the wife of Tsar Peter the Great. The city was founded in 1723, as a centre for mining and as a gateway to the Urals and Siberia. The town owes its origin to a metallurgical and metal working plant which rose on the banks of the river Iset, and by the standards of those days was one of the best not only in Russia but also in Europe. Shortly after the 1917 October Revolution, Russia’s last Tsar and his family were taken to Ekaterinburg. When in 1918, forces of White Russia were about to take the city from the Red Army, Tsar Nicolas and his family were executed. In 1924 the city was re-named Sverdlovsk after Sverdlov, a close associate of Lenin. After Perestroika, in 1992, the original name Ekaterinburg was returned to the city. During World War II, many government technical institutions and whole industrial plants were evacuated to Yekaterinburg from the war-affected areas (mostly Moscow) and many remained in Ekaterinburg after the war was over. Today Ekaterinburg is a modern city with tram, trolley, bus routes and a subway. There are more than 200 schools, 50 technical schools, 14 higher education institutions, including the Urals State University, founded in 1920; the Urals State Technical University, with more than 25,000 students, Ekaterinburg medical institute. Nine local TV channels and many radio stations broadcast their programmes in Ekaterinburg and the Sverdlovsk region. In the city there are six theaters, including an opera house, a circus, four sports stadiums, several concert halls and museums. Over 600 libraries, including Belinski library founded in 1899, stock some 15 million books. The city is served by a number of international airlines including Lufthansa and British Airways.